The front page of yesterday's New York Times revealed a house of horrors at the U.S. Meat Animal Research Center, situated on the plains of western Nebraska. In a superb but deeply disturbing piece of investigative, long-form journalism, Times reporter Michael Moss told the story of scientists performing ghoulish experiments on farm animals, trying to get cows to produce twins or triplets, and pushing sows to produce even more young, with all too apparent disregard for the animals' welfare. The scientists there have been trying to make the animals grow even faster, so that factory farmers can send them off to slaughter even sooner, even though so many animals on factory farms already suffer chronic pain and premature death from absurdly fast growth rates. Among the hideous experiments Moss documented were pigs locked in steam chambers until they died, calves born with "deformed vaginas" and tangled legs, and sheep bred to produce lambs without any human assistance, with the newborns left to starve, freeze, or, as Moss documented, get battered to death by hail. If starvation or weather didn't kill the lambs, then coyotes did, since there were few guard animals to watch over the helpless creatures. The lamb body count chronicled by Moss was sickening, and a former veterinarian with the center blew the whistle on the daily cruelties perpetrated against farm animals excluded from even the minimal protections of the federal Animal Welfare Act. It turns out that you and me and other taxpayers are footing the bill for these previously cloistered and demonstrably cruel experiments. The U.S. Meat Animal Research Center is a federal government laboratory within the U.S. Department of Agriculture (USDA). So while virtually every other industry has to pay for its own research and development, the federal government is doling out millions to cover the most extreme and bizarre forms of R&D; for big agribusiness. Should the federal government be running labs and forking over tens of millions of dollars so that the coal industry can burn more coal and put more greenhouse gases into the atmosphere, or should it be funding R&D; for the tobacco industry to make a better-burning cigarette? Where are the conservative and libertarian voices demanding an end to this feeding at the government trough? 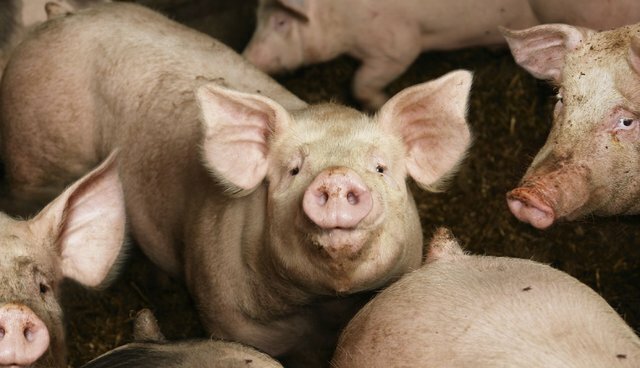 At a time when there is a national crisis of confidence due to the systemic mistreatment of animals on factory farms, enormous concerns about waste that pigs warehoused in Concentrated Animal Feeding Operations (CAFOs) and cattle at overcrowded feedlots dump into the ground and water, and the methane and greenhouse gas emissions from animals, the Center is unashamedly seeking to boost efficiency and profits for agribusiness, always at the expense of the animals' welfare. In one set of experiments, the Center bred mother pigs to have so many piglets that they couldn't help crushing some to death. Indeed, in a particularly telling passage, Moss notes that a proposed animal welfare study was nixed because "the center said it lacked the expertise to assess the pain felt by animals." It is a reminder that the federal government has hardly heeded a word of the path-breaking 2008 report of the Pew Commission on Industrial Farm Animal Production. That report, prepared by a blue ribbon panel of experts including former Secretary of Agriculture Dan Glickman, warned of an "agro-industrial complex - an alliance of agricultural commodity groups, scientists at academic institutions who are paid by the industry, and their friends on Capitol Hill." Every year the USDA spends billions on crop subsidies for corn and soybeans (providing a huge discount on feed costs for factory farms), crop insurance, predator control, waste management, and all manner of other giveaways. The government even organizes and administers commodity "check off" programs for the beef, pork, dairy, and egg industries - programs that collectively amass hundreds of millions of dollars to boost demand for these industries. Pork and beef industry leaders use these check-off dollars as a slush fund to operate their offices and staff, and perhaps even to engage in political campaigns. In Missouri last year, it appears that pork producers used check-off funds to advocate for a controversial "right-to farm" measure. Six years ago, only our actions in court prevented $3 million from the egg check-off program from being diverted to run advertising aimed at weakening support for California's Proposition 2. You'd think that with all this government largesse, agribusiness would accept some social responsibilities. But while it takes federal dollars by the fistful, it takes umbrage at any regulatory ideas that are suggested by lawmakers or the USDA itself. It fights efforts to stop the non-therapeutic use of antibiotics, which are used in extraordinary volume to spur growth and to keep overcrowded animals from getting sick. The chicken industry works against including poultry under the protections of the Humane Methods of Slaughter Act, even though nine billion chickens and turkeys are sent to slaughter in the United States each year. The pork and cattle industries fought animal welfare standards in the egg industry because they don't want any federal regulation of their industries. Indeed, factory farms every day inflict cruelties on animals about as shocking as the cruelties inflicted on the animals at the U.S. Meat Animal Research Center, and they don't want to have to modify their production methods one bit or give the animals even a few inches of extra space or a quick death. They want the money from taxpayers, but none of the responsibility of adhering to the value systems of those consumers - all along whining about the heavy hand of government. The government of Canada doles out millions in subsidies to the sealing industry, the Japanese government funds the whaling industry's killing and marketing, and the United States government breaks the bank to aid the factory farming lobby. This whole broken, busted, cruel system needs to be reformed from the ground up. The USDA needs to stop serving as the R&D; arm, surplus buyer, feed subsidizer, and advertiser for the factory farming industry. Really, these guys can make it on their own. Let's have a little bit of the free market back at work, and stop a program built on vast subsidies and few rules. After President Lincoln founded the USDA in 1862, he called it the "People's Department" for its potential to positively impact so many people's lives. It's time for the USDA to live up to that name.